Overall 10" long - With Sheath 10 3/4"
Max blade width: 2.2 cm-0.8"
Weight: Weight 3 3/4 oz With Sheath 5oz. A: HORN- Our late medieval table knife reproduction with black horn handle and brass wire. The point is equipped with small notches for use as a skewer; the blade is blunt. Includes a natural leather scabbard. MEASUREMENTS: Blade 6 1/2", Overall 10" long - With Sheath 10 3/4", Weight 3 3/4 oz With Sheath 5oz., Carbon Steel. B: BONE- Handle bound with Brass and Copper Wire. Our Medieval Table Knife with medieval design. 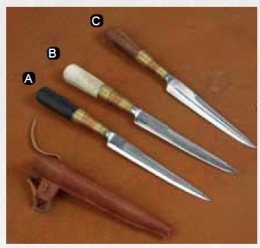 Table knives were used by all classes. This knife comes with hardwood handle and forged carbon steel blade. Includes a leather sheath with belt ring. MEASUREMENTS: Blade 6 1/2", Overall 10" long - With Sheath 10 3/4", Weight 3 3/4 oz With Sheath 5oz., Carbon Steel. C: WOOD- Handle bound with Brass and Copper Wire. Our Medieval Table Knife with medieval design. Table knives were used by all classes. This knife comes with hardwood handle and forged carbon steel blade. Includes a leather sheath with belt ring. MEASUREMENTS: Blade 6 1/2", Overall 10" long - With Sheath 10 3/4", Weight 3 3/4 oz With Sheath 5oz., Carbon Steel. This knife is based on an original currently in a private collection that was recovered from the river Thames in England. This page was last modified on 9 June 2014, at 15:11.